Bellfountain Cellars was established in 1989 by Robert and Jeanne Mommsen. Robert worked for a Canadian mining company as head of U.S. operations. The Mommsen’s fell in love with Oregon and purchased property south of Corvallis within the Coast mountain range. They liked the property as temperatures were about 10 degrees warmer than nearby areas. A 10-acre vineyard was planted to Pinot Noir, Chardonnay, Pinot Gris, and Cabernet Sauvignon. The winery produced about 60% reds and 40% whites. The wines were well received. It is thought that the winery operated until the late 1990’s. 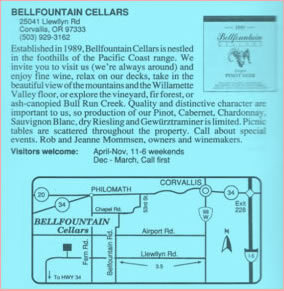 Bellfountain Cellars was located at 25041 Llewellyn Road, Corvallis, OR 97333. The Mommsen’s were living in Ohio when they decided a lifestyle change was necessary.